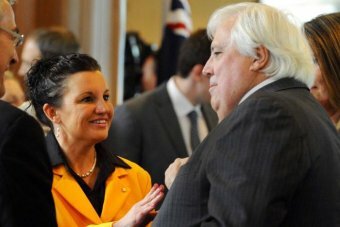 Leader of the Palmer United Party and dinosaur enthusiast Clive Palmer has today announced that Palmer United Party Senator Jacqui Lambie has been demoted from head class clown to deputy class clown. The move follows weeks of tension between Lambie and Palmer, stemming from Lambie’s dissatisfaction over the government’s treatment of the defence force and her vow to vote against government policy until defence force wages are raised. The (un)Australian reached out to Senator Lambie for comment, however we didn’t measure up to her requirements.